Turns out, the same celebrity role models that influence the way we look and act, also influence the way we speak. Even those we admire most are riddled with verbal crutches – like, um, ya’ know, whatever, ah, so, I mean, I can’t even! These disfluencies are contagious and most everyone I know in Generation X, Y and Z is guilty of the “like, ya’ know” syndrome. But, in order to present our best selves, we should speak to mpress. With this is mind, here are three excerpted interviews with Zooey Deschanel, Lena Dunham and Caroline Kennedy. I love singer/songwriter and “New Girl” actress Zooey Deschanel, but this interview made me think, maybe she should be renamed the “Like Girl”? Lena Dunham is the total package. She is an accomplished actress, author, screenwriter, producer, and director. But even this brilliant woman, has fallen prey to the “like” syndrome. Time Out New York, January 15, 2015. Q: What is your favorite place in New York? My favorite place is the Cloisters, even though I barfed there once in 6th grade on a field trip, and did other things I don’t want to talk about, but I just think it is the most beautiful and peaceful place and I love places NY like the Cloisters, or like City lsland or like Ditmus Park in Brooklyn where you cant believe it is the city, especially because I grew up like right on Broadway between Prince and Spring like right in New York so any time I went to a place that felt like this secret pocket of non-city New York it was really thrilling. I was always obsessed when I was in middle school like going to the tenement museum or anything that just like harkened back to a like a new york life that was a little less new yorky, I was obsessed with like it was farm land, so that’s why I love those places. 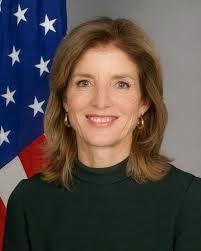 Caroline Kennedy is an author, lawyer and U.S. Ambassador to Japan. She is the daughter of U.S. President John F. Kennedy and First Lady Jacqueline Bouvier Kennedy. In this New York Times interview she said “you know” 142 times, which many media reported may have contributed to her downfall in claiming Hillary Clinton’s Senate seat. I’m, you know, actually, Andrew Cuomo is someone I’ve known for many, many years and we’ve talked, you know, throughout this process, so, you know, we have a really good relationship and I admire the work he’s doing now and what he’s done, so I’m not really going to kind of criticize any of these other candidates, because I think there are a lot of people with great experience, and, you know, any one of which the governor could easily pick and they’d do a good job.